Ballots in OSBA elections can be submitted beginning today, Nov. 13. A resolution on all regional ballots seeks to clarify OSBA’s legal standing. OSBA is seeking to reorganize as a nonprofit to ensure it can continue its legislative advocacy while remaining tax exempt. For most members, the change would have little effect, but it would mean that charter schools will no longer be allowed to join OSBA as associate members. Charter schools would still be able to receive services, though, by working through their sponsoring districts. 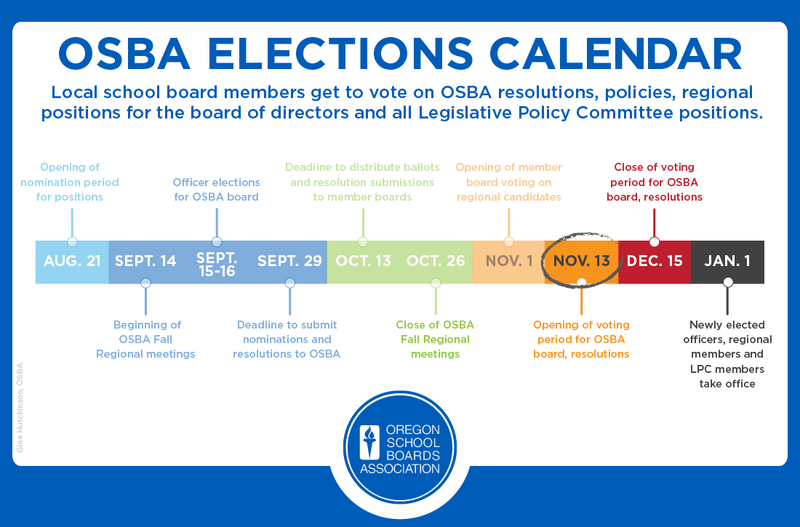 School boards have until Dec. 15 to register their vote on the resolution and their picks for the OSBA Board of Directors and the Legislative Policy Committee. School board members decide within their boards how the board as a whole will vote. Each school board gets one vote on regional candidates and the resolution. Eleven board positions are up for election: Gorge (2), Central (3), Southeast (4), Lane (6), Clackamas (7), Linn/Benton/Lincoln (10), Marion (12), North Coast (14), Washington (16) and two Multnomah seats (17 and 18). Two of the board races are competitive: Sami Al-AbdRabbuh vs. Terry Deacon for Position 10 and incumbent Michelle Vo vs. Mary Botkin for Position 17. All 19 Legislative Policy Committee positions are up for election. Members serve two-year terms and help develop OSBA’s legislative approach. Two of the Multnomah races for the Legislative Policy Committee are competitive: Dave Carter vs. incumbent Amy Kohnstamm for Position 18 and John Hartsock vs. Rita Moore for Position 19. OSBA provides official ballots by region. Governance: How does it work? Developing our OSBA legislative agenda: What is the timeline?